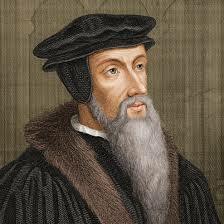 This is not my mom, but since she would probably not like any photo I picked of her, I’m giving you one of John Calvin instead. On a whim last week I stopped to try and think about who, out of the various books, pastors, and theologians I’ve been shaped by, has most shaped me theologically. I started rifling through the names–Calvin, Vanhoozer, Horton, Wright, Barth, Newbigin, Kreeft, Lewis, Kierkegaard–and came up with a surprising answer: my mother, Arliett. This is no joke, or even my attempt at a heart-warming post about dear old mom (who really isn’t old anyways), it’s just a practical point. For all the Calvin or Vanhoozer or Horton I quote, the deepest roots of my theological instincts can probably be traced back to my mom’s early instruction in the faith. I’ll be straight with you and say Mom doesn’t have what most would consider formal theological training. She was raised in a Catholic school and got saved in a Calvary Chapel Bible study a couple of years before I was born. There was no seminary and I don’t recall us owning a single systematic theology text in the home before I bought mine in seminary. Mom learned what she knew from a lot of Bible studies, personal reading, and a lot of hours listening to sermon tapes from Bible teachers. Still, she learned enough to be recognized by the leadership and was eventually asked to be a bible study leader in the women’s groups at our churches. Her first aim though, besides knowing and loving Jesus herself, was that my sister and I would know him too. For the first few years of my life in church, she was my Sunday School teacher using the flannel-graphs, telling us the stories, and teaching us from the Word of God. When she had a major surgery related to a tumor when I was in Jr. High, she told us afterwards, that her one prayer was that she would live so she could make sure and encourage us in our faith until we were adults. And honestly, I can attest she did not let up–ever. Whether it was playing hundreds of hours of sermons in the car, buying us teenage devotionals, making sure we were in Bible studies, or praying for us in moms’ groups, we had a full-time spiritual cheerleader and gadfly in my mom. The Trinity is Non-Negotiable – Back when I was a kid we had Jehovah’s Witnesses and Mormons walking door to door a lot in our neighborhood. My mom was aware of this and told us one key question we should always ask when someone came around trying to talk about Jesus was “Do you believe in the Trinity?” If they didn’t, just tell them you do and don’t continue the conversation. While maybe not the best example of ecumenical dialogue, she wasn’t much interested in it at that point, but rather with the spiritual health of her children. She never mentioned Arianism, tri-theism, modalism, or the difference between the economic and immanent Trinity, but she did teach us very clearly that Christians confess a Triune God who is wonderfully Father, Son, and Holy Spirit. Anything else is not the God of Jesus Christ. Is it in the Bible? – Next, she taught us the importance of the Bible. Her and my dad both would read the Bible to us at night, (although she preferred my dad to do the reading before bed because she didn’t want us picking up her Honduran spanish accent in our English). In that, and a million other ways, she was always telling us that the Bible was where the truth of God was found. We weren’t fundamentalists rejecting all other books (my parents took me to the library a lot), but the bottom-line was, for faith and morals, if it wasn’t in the Bible, then it wasn’t binding on us for salvation, and should probably be avoided. Now, of late I’ve come to a more appreciative view of the weight of tradition, creeds, councils, etc., but that basic instinct to strive to trust the Word of God above all other words came through the words of my mother. We Have a Story-Shaped Gospel – This one’s kinda simple. Like I mentioned above, my mom taught us Sunday School. I learned a lot of Bible stories at her knee. Also, I don’t know if it was my dad or my mom who made the decision to use the sweet comic-book-style Picture Bible when we were kids, but that was a great move. From a very early age I had the inarticulate sense that the Bible was not just a collection of disembodied truths, but a series of stories telling the spiritual history of all the generations of believers that came before, leading up to the saving actions of Jesus Christ. Long before I read Hans Frei, my mom taught me about story. Balance – Another theological instinct bequeathed to me by my mom was a sense for balance. I’ve never been a fan of extreme positions or false dichotomies. For instance, I’ve always been peeved at those who try to pit a Christus Victor angle against the penal substitutionary angle or vice versa, in the atonement discussion when they’re both fully compatible with each other and found in scripture. (Col. 2:14-15) The one issue that I remember my mom giving me a sense of balance about when I was a kid was regarding spiritual gifts. We were at a decent Assembly of God church for a couple of years because they had a good kids program, but when I came home asking why I didn’t have the gift of tongues in the 3rd grade, my parents decided it was time to roll out. She made a point to tell me that yes, the ‘charismatic gifts’ like tongues and prophecy were real (not cessationism), but they were always to be used in proper order, and they weren’t necessarily for everybody (charismaniacs). We all have different gifts. Again, I’m pretty sure she’d never read Gordon Fee’s commentary on 1 Corinthians, but she taught me to handle the Word in a way that wasn’t reactionary or ‘enthusiastic’, but calmly responsible. Humility – Finally, my mom strove to teach me humility. I can’t tell you how often she would talk to me about Solomon’s humility in asking for wisdom. In a hundred different ways she warned me against pride in thinking I knew more than I did, simply because I usually knew a little more than the rest of my friends. This continued from the time I was a small child until I was in high school, and then in college, and on into grad school, and–you get the picture. For natural born sinners, humility before the Word of God and the God who is beyond fathoming is a lesson that can never be taught too early or too much. What Does this Have to Do with You? As I mentioned earlier, I’m not just trying to write a heart-warming post about my mother, or my childhood. My point in ripping through all of those truths my mom taught me is to encourage parents to understand their primary role in the spiritual education of their children. I didn’t learn those very important lessons in seminary, but in the home. I say this as someone who works in student ministries. I know about the wonderful programs, Sunday School teachers, directors, studies, and lessons that can be used to help shape the spiritual life of your child. The plain fact of the matter is that, at best, we get your kids for about an hour or two a week while you have them for the rest of it; there is simply no competition. You need to realize that your child’s spiritual life is not the church’s responsibility, but yours. We are there to help you do your job as a parent. See, your primary job as a parent is not to make sure that your kid gets on the right sports team, or the right college, or has a “successful life”, or is even “happy”. Your primary job is, by implicit example and explicit instruction, to point your child to Christ in all that you do. First, good for you–it is a big deal and from my experience in student ministries not enough parents care about it beyond wondering why we haven’t speed-sanctified their child for them. A little urgency isn’t a bad thing. Second, calm down–you are not responsible for converting them, as that is work of the Holy Spirit, but pointing them to Christ. Too much urgency will make you crazy.